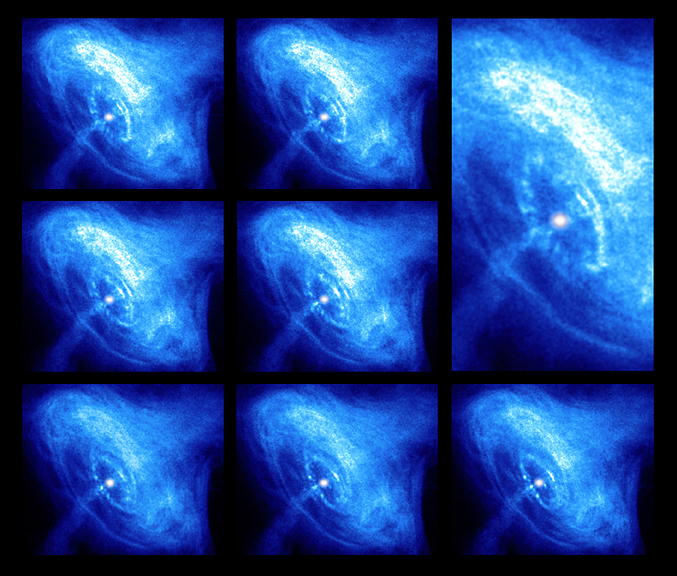 The Chandra images in this collage were made over a span of several months (ordered left to right, except for the close-up). They provide a stunning view of the activity in the inner region around the Crab Nebula pulsar, a rapidly rotating neutron star seen as a bright white dot near the center of the images. A wisp can be seen moving outward at half the speed of light from the upper right of the inner ring around the pulsar. The wisp appears to merge with a larger outer ring that is visible in both X-ray and optical images. The inner X-ray ring consists of about two dozen knots that form, brighten and fade. As a high-speed wind of matter and antimatter particles from the pulsar plows into the surrounding nebula, it creates a shock wave and forms the inner ring. Energetic shocked particles move outward to brighten the outer ring and produce an extended X-ray glow. 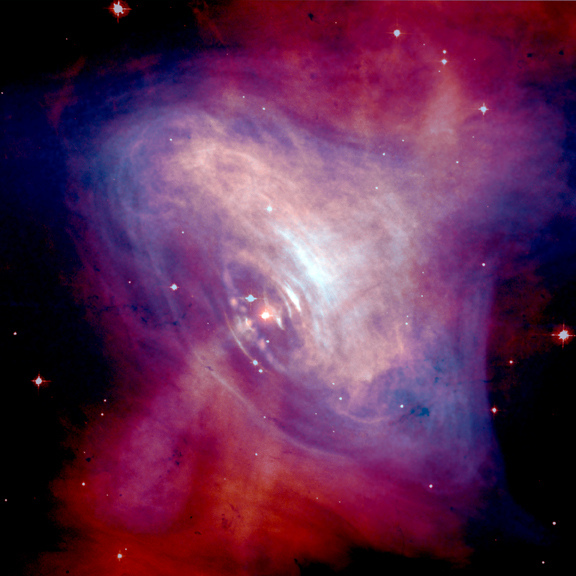 Enormous electrical voltages generated by the rotating, highly magnetized neutron star accelerate particles outward along its equator to produce the pulsar wind. These pulsar voltages also produce the polar jets seen spewing X-ray emitting matter and antimatter particles perpendicular to the rings. Scale Close up image is 0.8 arcmin, other 7 images are 1.6 arcmin. Coordinates (J2000) RA 05h 34m 32s | Dec +22° 0.0´ 52"
References J. Hester et al. 2002 Astrophysical Journal Letters, 577, L49.